As individuals concerned about the environment, many of us are aware of the adverse environmental impact of excessive consumerism. At the same time, we also realise that increased economic prosperity since the middle of the 20th century means that we are often surrounded by an abundance of assets. Many of us acquire or possess items that are infrequently used -- such as electric drills, power washers, holiday homes, books that are read only once and toys and bicycles that are outgrown. As communities become more aware of this abundance of assets, many initiatives have been set up around the world by organisations and individuals to share such assets. The advantages of a sharing economy, also known as collaborative consumption or a collaborative economy, are that it reduces the impact of consumerism on the environment (i.e. reduced need for materials extraction, production, consumption and disposal), saves money and resources, and connects individuals and communities. 7. 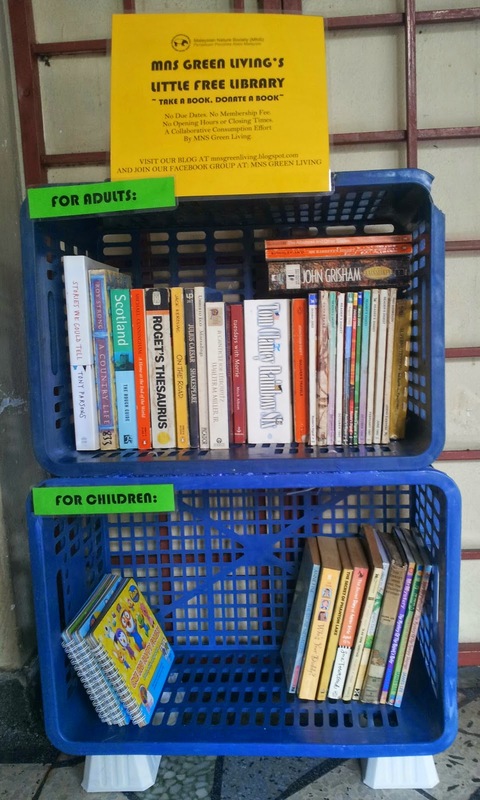 Little Free Libraries that do away with traditional membership and book return rules. 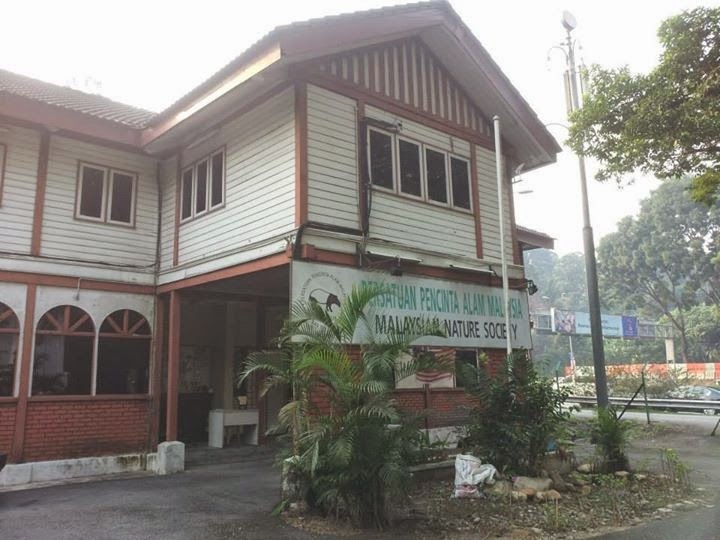 The Green Living SIG recently set up a Little Free Library outside the Malaysian Nature Society Headquarters at JKR 641, Jalan Kelantan, Federal Hill to advance the cause of collaborative consumption and also to share reading materials. It is located in the porch, outside the front door, right by the mailbox. 1. No due dates, deadlines, recording system or membership system. 3. Feel free to donate any books or magazines, and spread the word. 4. You can decide to return the book you took, donate another book in its stead, donate the book you took to a worthy cause, or keep it if you really love it. This is a non-profit collaborative consumption initiative, so please don't destroy, discard or sell the books from the Little Free Library! We wish you many happy hours of reading and hope you will drop by to take and exchange books. We also welcome suggestions for future collaborative consumption ideas (e.g. A community edible garden outside the MNS HQ? A Facebook Collaborative Consumption group offering pre-loved assets for sale/rental/barter/borrowing? 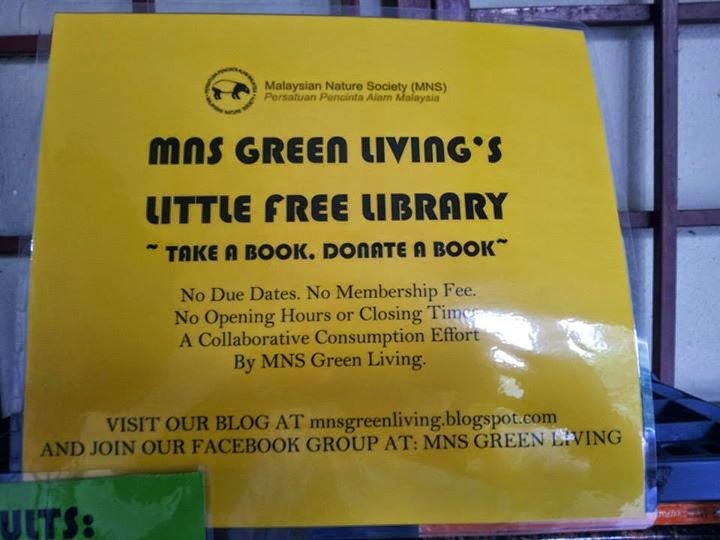 ), so please email us at gl.mnselangor@yahoo.com or leave a post on the MNS Green Living Facebook group with your fantastic ideas, and we promise you we will try to discuss and consider each one!